The Masters, held at Augusta National Golf Club, is notable for its picturesque scenery. Each April, the eyes of the golfing world turn to Augusta National Golf Club in Augusta, Georgia, for the Masters Tournament. Although the four majors have equal importance in a golfer's quest to win the Grand Slam, the Masters is often viewed as the most celebrated tournament a golfer can win in his career. Despite its significance, the Masters is the youngest tournament of the four majors. Celebrated golfer Bobby Jones, who won a Grand Slam in 1930 (the four tournaments were different than the modern-era events) was one of the founders of Augusta National. He wanted the golf community to hold a major event at his course, and by 1934 his hope had come true with the inaugural Masters. Horton Smith won the first event, taking home winnings of $1,500. Augusta National has numerous landmarks and notable sights, but one of the most celebrated is Amen Corner, the name given to the 11th, 12th and 13th holes for their difficulty. The holes, named White Dogwood, Golden Bell and Azalea, respectively, are a par-4, par-3 and par-5. The term Amen Corner was coined by American sportswriter Herbert Warren Wind. The 11th hole is challenging because of frequent wind, the 12th is short but wind and water are ever-present, and the 13th is a dogleg that gives players a shot at reaching the green in two strokes for an eagle attempt. Most golfers spend their entire careers hoping for a shot at Masters glory, but the majority don't get to wear the green jacket, which is presented to each year's winner by the previous year's champion. 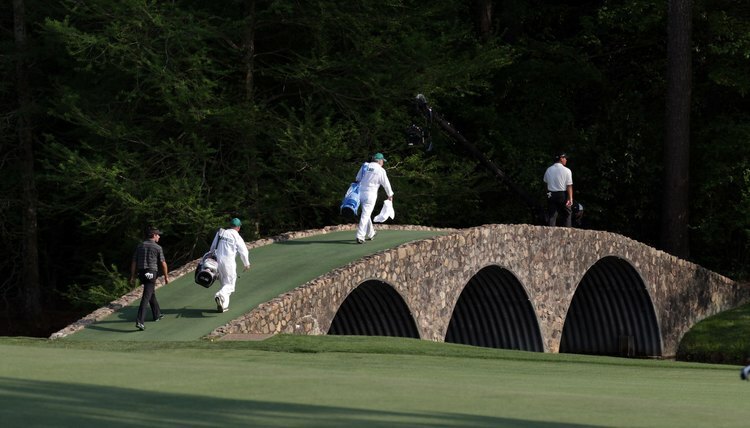 However, several notable golfers have been able to conquer Augusta National on more than one occasion. Jack Nicklaus won six Masters titles in his career and Arnold Palmer won four. Tiger Woods, as of 2011, has four titles, with the last coming in 2005. Five golfers, including Phil Mickelson, have won the tournament three times. The Masters is steeped in tradition in many ways. One of these annual traditions is the champion's dinner, in which the previous year's winner hosts past champs with a meal of his choosing. This dinner takes place on the Tuesday prior to the tournament beginning, and allows players from different countries to showcase their nation's specialties. Another tradition involves having one or more golf legends begin the tournament with a ceremonial tee shot. The list of golfers honored in this tradition includes Gene Sarazen, Sam Snead, Palmer and Nicklaus.